At 3:00 AM today, the low pressure area (LPA) inside the Philippine Area of Responsibility (PAR) was estimated based on all available data at 165 km Northeast of Surigao City, Surigao del Norte (10.7 N, 126.7 E). 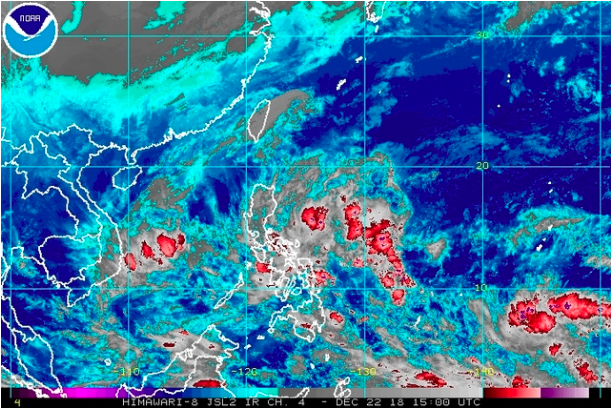 Northeast Monsoon affecting Luzon will bring more rain on Sunday, December 23, while a new LPA has been spotted outside PAR. PAGASA warned that light to heavy rain is expected in the Visayas, Bicol, Mimaropa, Caraga, and Northern Mindanao on Sunday.